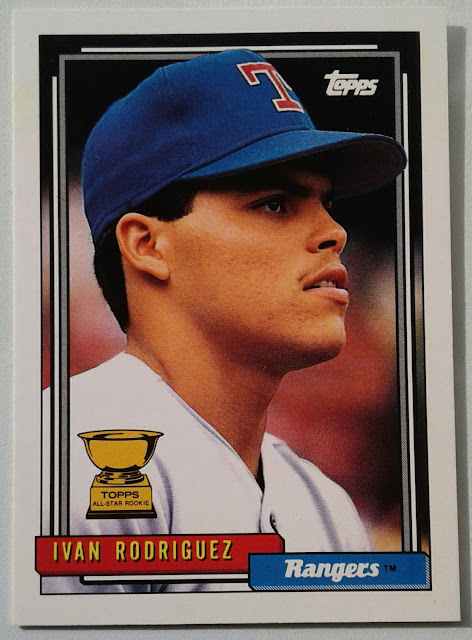 Twenty-Five Years ago Ivan Rodriguez made the 199 Topps All-Star Rookie Team. In 88 Games he batted .264 with three Home Runs. The numbers were good enough to rank 4th in the AL Rookie of the Year voting which was won by Chuck Knoblauch. Pudge spent the bulk of his 21 year career with the Texas and he will be the first player enshrined in the Hall of Fame with his primary team listed as the Rangers. He is also the Franchises first rep, as all the Senators inducted are from the DC->Minnesota squad. Rodriguez was selected for the Hall in his first year of eligibility, although his 76% tally was just one point above the 75% Hall of Fame threshold. Regardless it puts Ivan Rodriguez in the inner circle of Hall of Famers. Of the 15 Catchers in the Hall, I think he and Johnny Bench are the only two to get in on the first ballot. I was to lazy to look up a Box for the FSL All-Star game referenced, perhaps I will add it to this posting in the future. I like the fronts of 1992 Topps, but I am not a fan of the wasted space on the back. Do we really need the same picture of the stadium for every player on the team? It is a pretty dumb concept when you think about it, I mean how do you capture a stadium in basically a landscaped thumbnail. 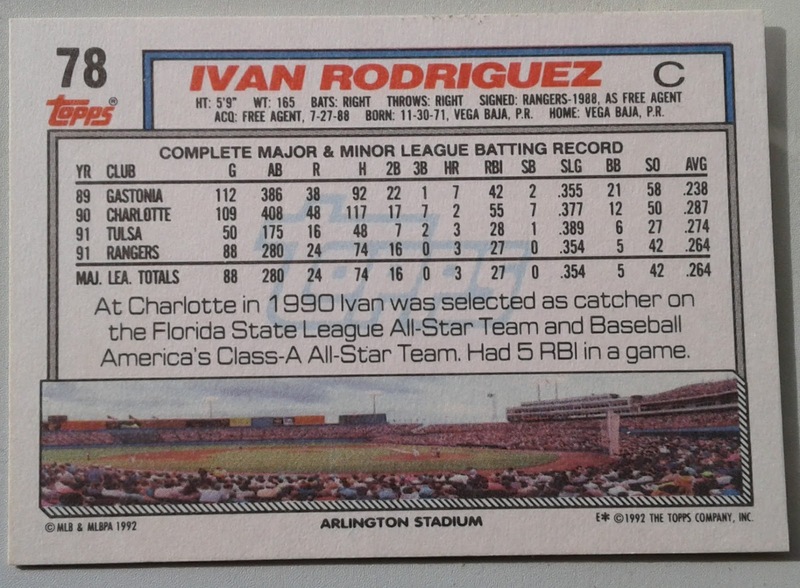 This is an Index to our postings related to the 1991 Topps Rookie All-Star Team. The award is for the 1991 season with the cards issued in the 1992 season. The Phillies had five cards in the initial Masterpieces set. This is one of two dedicated to Ryan Howard. The two Howard cards are similar and we look to cover that in a future column. One of the attractive aspects of the Masterpieces is the canvas-like feel of the cards. I believe the cards feature original artwork (based off a photograph). Unfortunately Upper Deck did not identify the artists on the Baseball Masterpieces. This was handled differently with UDs release which credited the artists and sometimes provided website info. It appears a little dark here but this is one of the Green Parallels. These are the most common Masterpiece parallel and are not serial numbered. 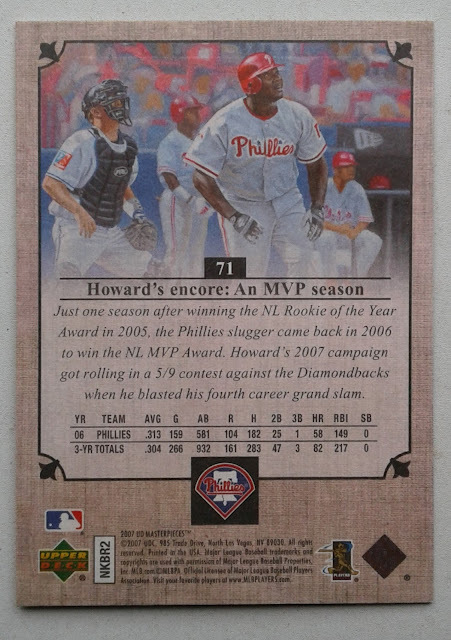 After a synopsis of Howard's accolades from his early career the card back goes onto mention a game played on May 9 2017. After being shutout by the Diamondbacks Randy Johnson for six innings the Phillies were able to put up a series of crooked numbers earn a 9-3 victory. The comeback was all started by the Grand Slam mentioned on 2007 UD #71. Howard did not hit his blast off of Randy Johnson. 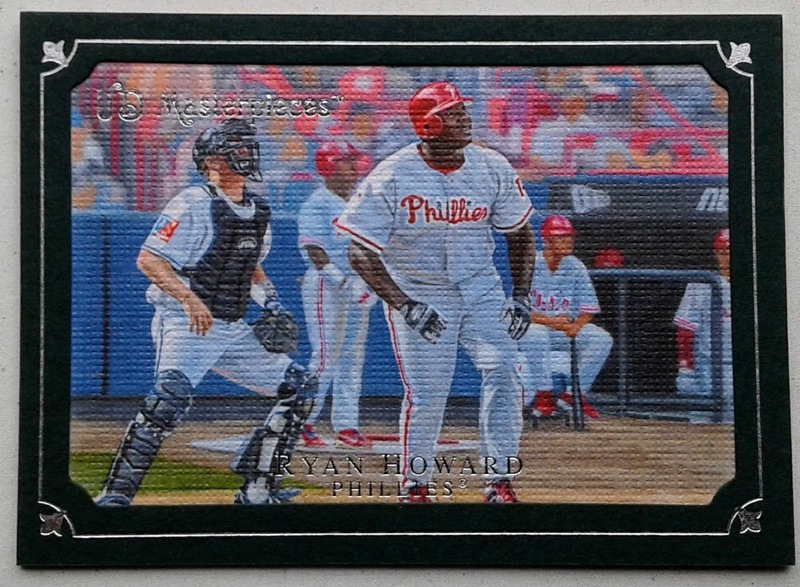 In fact manager Charlie Manuel elected to not start Ryan Howard versus the Big Unit. However, in the 7th inning Johnson loaded the bases and was over 100 pitches. The situation forced Arizona manager Bob Melvin to go to his righty reliever Brandon Medders. Ryan Howard hit the first pitch for the Homer, tallying his fourth career Grand Slam. According to Baseball-Ref the hit had a WPA(Win Probability Added) of +35%. When I was posting more frequently I thought a Series to commemorate the tenth anniversary of UD Masterpieces would be fun. While I don't anticipate hitting all 90 cards, I would like to dedicate some time to the set during the course of the season. 42 Tony Gwynn / Cal Ripken, Jr. It would not be a stretch to say that I learned math from the back of baseball cards, nor would it be any further from the truth say that Jim Bouton taught me how to read. Tonight the Yankees are visiting the Cubs on Sunday Night baseball, while this week the Phillies will host a rare series with the Mariners. The player I have chosen to tie together these two series is Bouton. Bouton is remembered for two careers. The first was as a baseball player in the New York Yankees organization. His other career was as an author while employed by Seattle's first MLB tenant the Pilots. 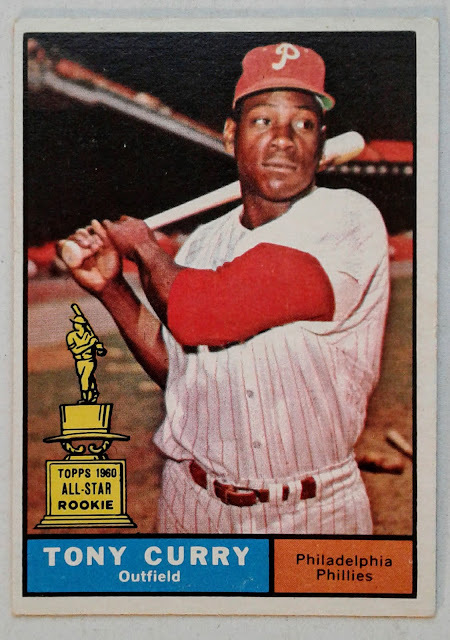 The card above is from an eight card subset (#132-#139) in 1965 topps. Each of the first seven cards in the set represents a game in the series. 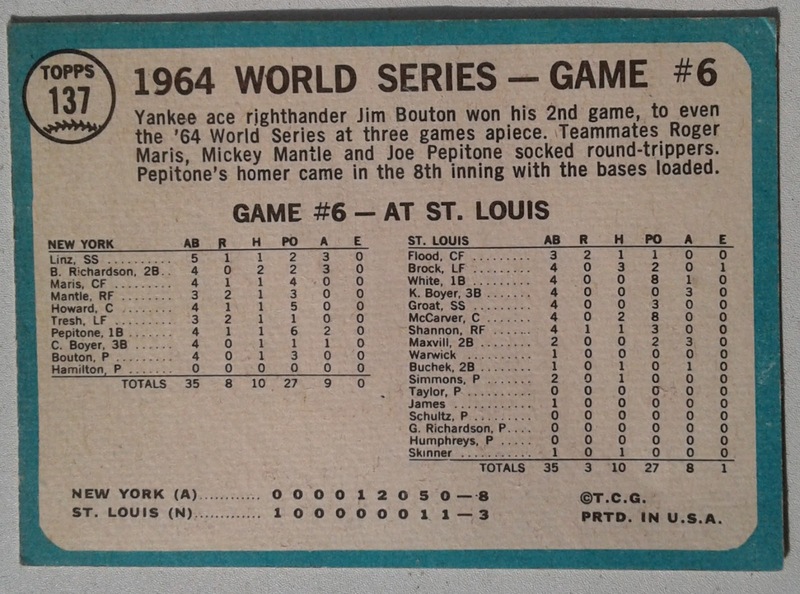 Card #137 above speaks to game 6 which the Yankees won 8-3 behind Jim Bouton's strong pitching and a trio of Home Runs by Roger Maris, Mickey Mantle and Joe Pepitone. The B-side gives a detailed box score which includes fielding stats but ignores RBIs (early SABRmaticians no doubt). In addition to the box the card text provides a concise synopsis of the games events. 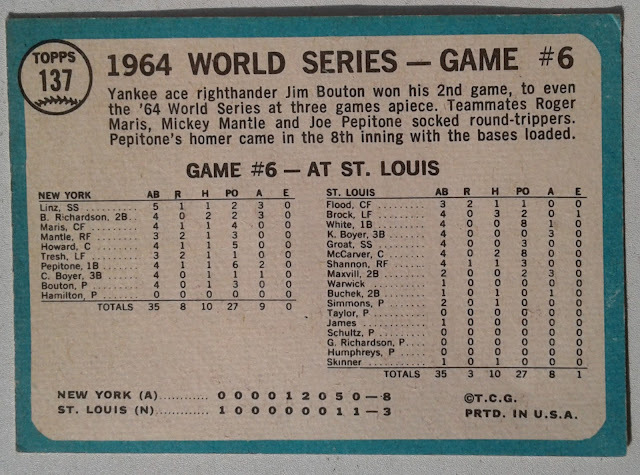 After 1964 Game 6 the Yankees would not win another World Series game until 1977. 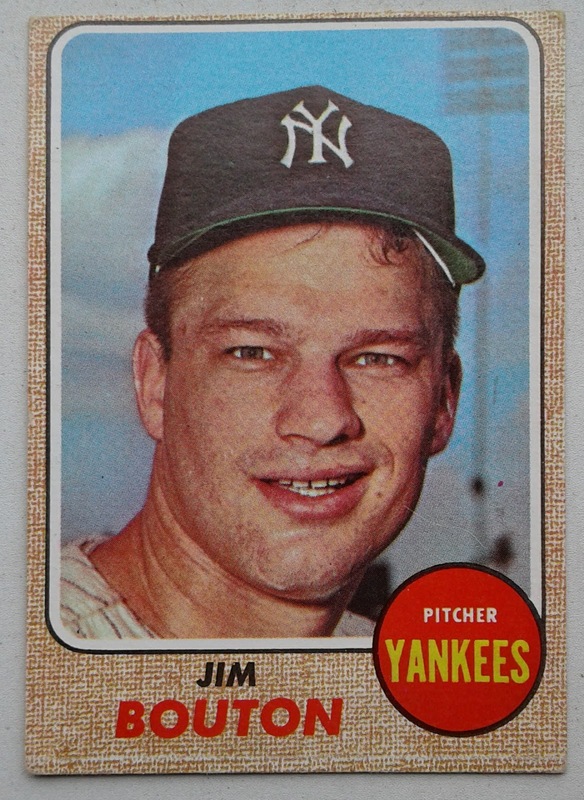 Jim Bouton is going to one of the guest speakers at this years SABR convention in New York City. In Preparation for the event I have just begun reading "Ball Four" for what I believe is the 3rd time. I first encountered the book when I was in my early teens. I re-read the book as an adult, probably in my 30s and now approaching my milestone 50th birthday I am giving the work a third pass. I will always enjoy the anti-establishment humor of "Ball Four" and am looking forward to this reading. I anticipate this will be my most enjoyable session with the book. 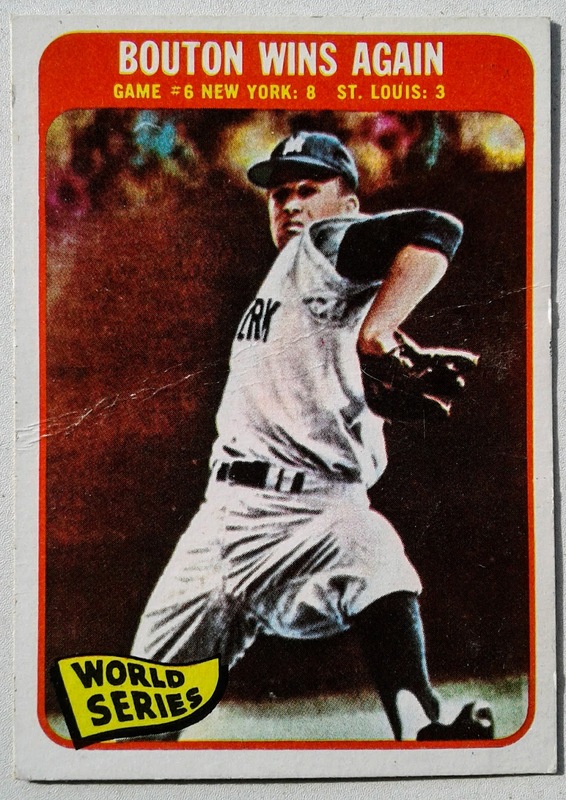 Through my rediscovery of baseball cards I have become more familiar with the players and stories from the "Ball Four" era, hopefully this re-read will generate some fun posts. 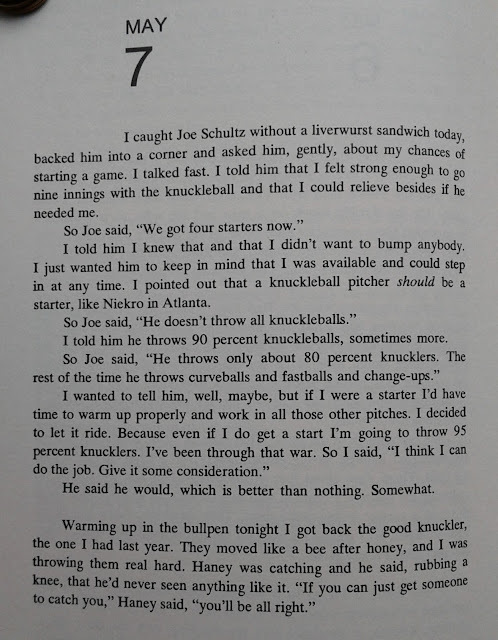 In his entry for May 7th Jim Bouton mentions a disagreement he had with manager Joe Schultz over his role on the team. Schultz (as well as pitching coach Sal Maglie) wants Bouton to mix in more fastballs and curves with his knuckler. Bouton counters that Phil Niekro throws mostly knuckleballs. 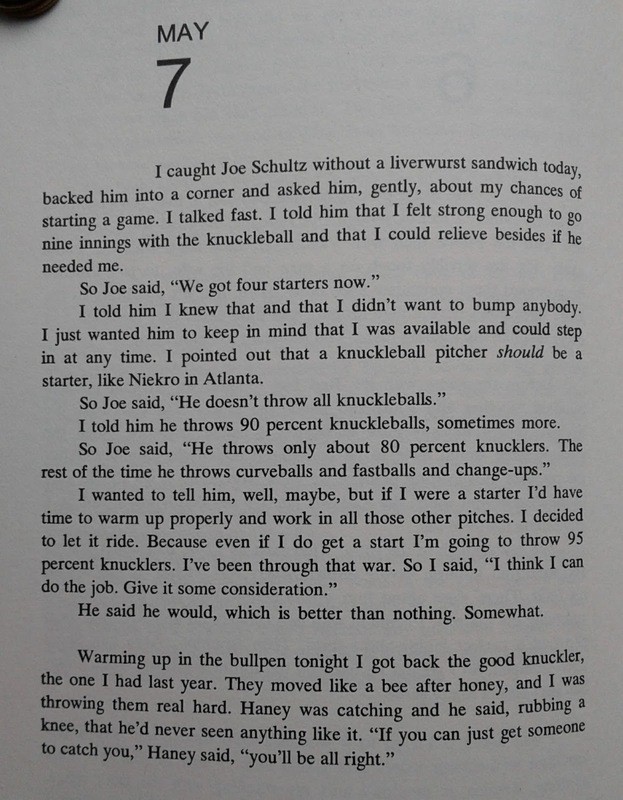 The ensuing argument devolves into a petty negotiation over Niekro's pitch selection. That day Seattle lost 5-4 to Boston in a game that did not involve Bouton. Red Sox Shortstop Rico Petrocelli had a Home Run for the victors. Last night with Cubs featured on Sunday Night Baseball we featured a Rookie Cup card of Hall of Famer Ron Santo. Tonight we feature one of the Phillies representatives from the same Topps Rookie All-Star squad that featured Santo. 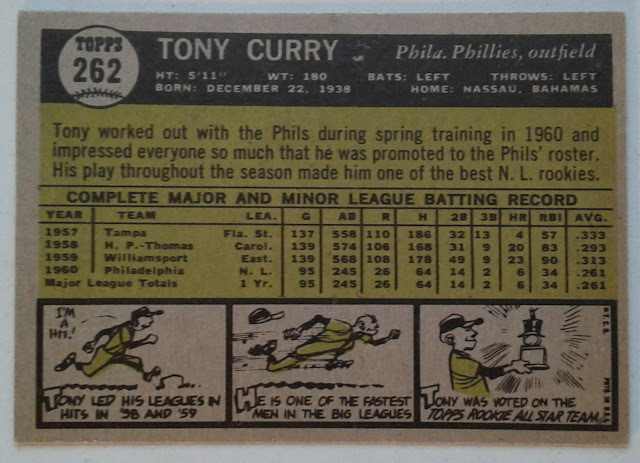 Tony Curry was the second player born in the Bahamas to reach the majors (following Andre Rodgers 1957). Curry had a decent debut with the Phillies batting .261 with 6 Home Runs in 95 games. Unfortunately those would be the only six Homers that Curry would hit in the major leagues. Due to a contract dispute and personal issues Tony Curry would only play 15 games with the Phillies after his rookie season. Prior to the 1962 season he was traded to Cleveland and would only return to the majors one more time for a brief stint in 1966. A few notes on the cartoons. I want to start on the last panel first. As mentioned in our Ron Santo posting yesterday, of the 10 Rookie All-Star cards in the 1961 Topps set seven of them have cartoons that mention the Topps award. Next I want to go to the middle frame. I realize those were different times but "One of the fastest men in the Big Leagues" stole a grand total of ZERO bases in his major league career. Minor league records are spotty but baseball-reference lists Curry's single season minor league high as eleven stolen bases. Matt from Number 5 Type Collection Column on "Selected by the Youth of America"